There are several species of weedy smartweeds. Some are aquatic and all prefer moist sites. 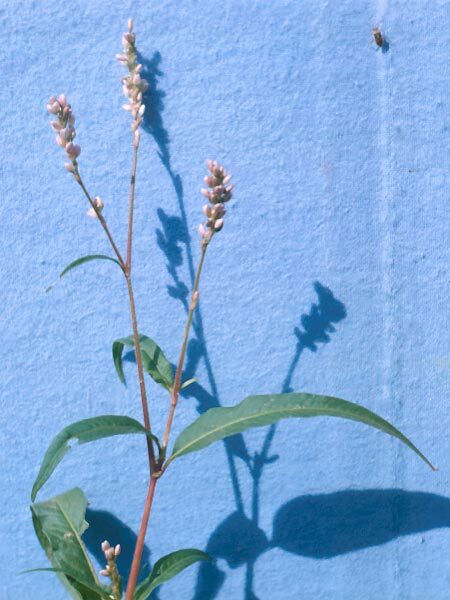 Polygonum arifolium and P. sagittatum are called halbard and arrow-leaved tear thumb respectively because of the sharp spines on the stem. Water smartweed (P. amphibium) grows equally well in water and on dry ground. P. aviculare and P. erectum are called knotweed. The first is a serious pest in lawns. Carey's smartweed (P. careyi) is characterized by long drooping clusters of flowers and is often seen in blueberry fields in the Pemberton area. P. convolvulus is a vine type and is called black bindweed. P. scandens is also a vine and both are serious weed problems where found. Japanese knotweed or Mexican bamboo (P. cuspidatum), is a tall growing, perennial weed which is almost impossible to control. P. sahalinense is similar but much more robust. Pennsylvania smartweed (P. pensylvanicum) is one which grows well on rich, well drained soils and so is a weed problem in crops.